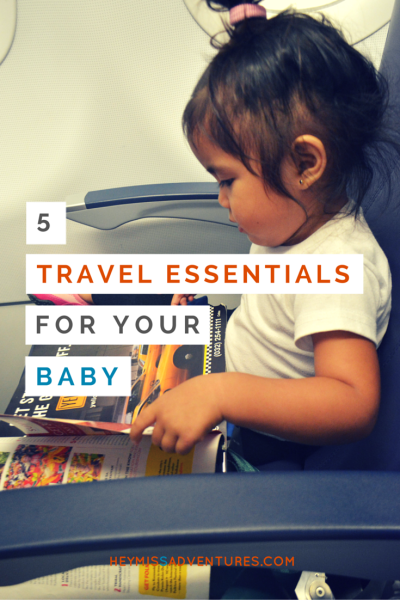 5 Travel Essentials for Your Baby | Hey, Miss Adventures! Traveling and exploring new places is a very rewarding experience but it becomes an even more enjoyable one when you do it with your baby. You probably think bringing around a small kid – who probably could not remember details of the trip, by the way – is too exhausting and is probably not such a good idea but, think again. Kids might thrive on routine but they are also very adaptable. They can easily adjust to new environment, new dishes (you will be surprised!) and basically everything else. If you carry around an infant, things will even be much easier because all they will basically do is sleep in your arms and you can simply go about your business, exploring sights and experiencing awesome adventures. Baby carriers are perhaps the best invention made for parents ever. It is basically great for infants and very young children who love the security, warmth and comfort that they feel in their mother’s womb. Parents can keep their babies close while making sure that they stay hands-free. Carriers are also made for older kids and for special purposes such as going hiking. These types of carriers, usually backpack carriers, allow the child to sit comfortably, enjoy the sights or even take a nap and the parent can continue walking so delays along the way are minimized. Babies basically only need clothing and milk to thrive in this world. Milk is a definite must-have wherever you decide to go so make sure that you always have a few bottles, a milk dispenser and a bottle brush with you. You can simply rinse the items with hot water in order to sterilize it before use. Breastfeeding moms have it easier and they just need their breasts – and perhaps some cover if they aren’t too comfortable with exposing their milk machine – and everyone is all set. Babies need hundreds of diaper changes in their first year of life. Diapers make travel much more comfortable because you never have to constantly worry about leaks and blowouts (okay you do, but not that much anymore) on the road. Changing pads are not exactly an essential but they are a great must-have to help protect your baby’s bum from hard, cold and dirty surfaces. There is nothing worse than a fussing baby while on a trip and this usually happens when they are hungry. If you have an older kid, always make sure to pack a few small bags of snacks for them to munch on the road. Hell hath no fury like a hungry baby. Carriers maybe the easiest way to transport kids but they can get painful as the kids start getting older and heavier. Strollers are the best companion for such trips, especially when you are simply walking around the city. You might want to make sure to opt for strollers that have huge storage spaces so you no longer have to carry those heavy diaper bags with you. Or you could also opt for the super lightweight umbrella strollers if you are just going for short walks around the area, too. Having an umbrella stroller for your baby will not only make it easier for you to transport them but will also make sleeping and stroller comfortable for them. For more great travel essentials check out Kokopax.com and read their best baby travel system reviews. That’s it. Stop dreading your first adventure with your baby – it will be awesome. Just enjoy each other and everything will fall into place. Want more tips regarding parenting? Check out ParentAdvice for awesome tips.